It tends to be different for all of us. for some it could be a forthcoming summer vacation or a wedding. For others, it can be clothes not fitting anymore, no matter what it is that has brought you to this point, the main thing that matters now is how you go forward. The first thing you need to know if you are looking to lose weight, is how many calories to lose weight you need. Get a true understanding of your calorie requirements, and you have laid the foundations from which you can build your weight loss plan. The resting metabolic rate chart I have included below gives you a calorie range you should work with. 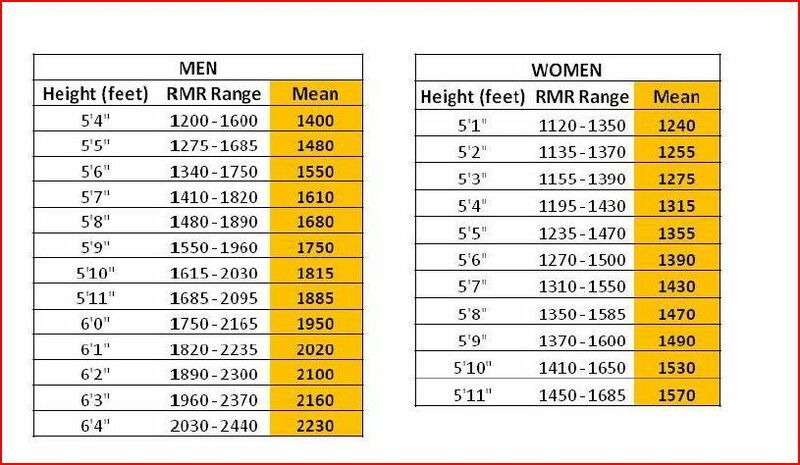 Simply look up your height, and use the yellow ” mean” number for you daily average. From my own experience of losing weight I am very much in the calories in, calories out is what matters camp. My weight loss success was not down to anything other than calorie restriction. I did not stop eating any foods that I enjoy, I have been there and done that, and it just does not work. This time, I just focused on eating less. The big question you have to ask yourself is how do you want to do it ? I can only tell you what has worked for me, but If you are now at a point where you need to lose weight, and you are motivated to do so, then I see no reason why you can’t adapt my weight loss methods to work for you. If you want to lose weight, one way or another, you have to find a way to cut calories below your daily needs. My main tool has always been intermittent fasting. I like it not only for the fat burning advantage it gives me, but also because it suits my lifestyle. Eat Stop Eat is what I started using back in January 2009. I also have done a personal eat stop eat review that you can read. Also along the calories in vs calories out theme is John Barban’s Anything Goes Diet again, you can also read the anything goes diet review and see real weight loss examples. Because I do this weight loss blog I am often asked what is the best diet plan, or ” what is the best way to lose weight ” well my answer is always, the same…. The best way to lose weight is the way that works for you. My life, is not your life, so doing EXACTLY as I do will not work for you. What will work is understanding what is important for weight loss, and what isn’t. Once you are clear on that , then its simply a case of working the right things into your normal daily life. The principles in the 2 diet plans I have mentioned are what I have used, and continue to use to keep my weight under control. I am not special, and I am far from perfect, but I was able to lose over 65lbs by ignoring all the Diet B.S. that you hear from people and read in the media day after day. I was not fat because I had a slow metabolism, in the same way that I am not now lean because I have a fast metabolism. My metabolism has not changed, and my guess is your own reason for saying ” I need to lose weight ” has nothing to do with your metabolism either, but it will have everything to do with consuming too many calories, and that is what has to change. If you are just starting out on a plan to lose weight, I would suggest you keep a food diary for 7 days, 14 days would be even better, but certainly for 7. Don’t even think about weight loss at this point, just make a note of your normal eating plan. I remember when I did my food diary, I was amazed by how many cups of coffee with a cookie I had each day… we are talking 600 + calories worth a day, if you had asked me without writing it down, I would have estimated no more than 200. Just being aware of that one daily habit meant I could save 1000′s of calories per week, without any major sacrifices or changes. That is just one example of how I started to eat less. This is one of the biggest problems of weight loss, we underestimate how many calories we consume, and we overestimate, how many calories we burn. The result is we keep gaining weight until we correct that problem. Unless you are going to live your life in a laboratory, you have no accurate way of knowing how many calories you eat, or how many you burn, so all you can do is make your best estimate. Round up the calories in the food you eat, and round down the exercise calories burned. Congratualtions, you made it through this post, but now it’s over to you, saying ” I need to lose weight ” is one thing, but now you need to make a start. So my next advice is start to today, there is no reason to put it off, good habits start today. There is always a party to go to, if you want, you can make excuses for every week of the year, there is always something, so the thing only you can answer is this…. When you said ” I need to lose weight ” do you want to do something about ? …. if so, start now. If you enjoyed this post, please hit the facebook share button and spread the word, be sure to check out my weight loss tips page, and to get more of my views on weight loss, also please subscribe to the Retired Dieter email list up in the top right hand corner of this site. Baked Bean Diet For Weight Loss ? It’s to bad that so many people are overweight. Education is of course key. It to bad we value entrainment more then health. If we valued our health more we would see less overweight people. Can’t give up have to keep spreading the weight loss information. We are a society where technology has started to rule our lives. It is too easy nowadays to just sit down in front of the TV and turn off your brain. What happened to the good ol’ days of actually spending more time outside and using our imaginations. I know I really struggle with this with my kids. They would obviously prefer to stay indoors and watch their shows. I’ll just keep pushing and try to lead by example! Hello Dear Friend, first of all thanks for sharing your personal experience with us. But i have same over weight problem. I have started diet as well as exercise. I also reduce my weight 15 kg withing 3 months. but when i stop this my weight increase 6 kg within month. can u please guide me why it is happening? from what you say, its the start/ stop approach that is the problem. You can’t lose weight, then stop and go back to how things were. I was the same. The only way I overcame this problem was by finally getting an understanding of how much I could eat without gaining weight. I just learnt to eat less. Previous post: Tips For Weight Loss – Listen To Chris Gardner.